Director, Centre for Scientific & Innovative Research Studies, Lucknow-India. Asst. Professor, Dept. of Rog Nidana, Government Ayurvedic College, Jhansi-Uttar Pradesh. Asst. Professor, Dr. B.R.A. Rajkiya Mahavidyalaya, Kannauj. 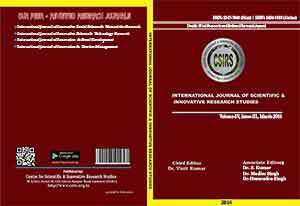 International Journal of Scientific & Innovative Research Studies is an international journal that effectively bridges the gap between academics, policy makers, and practitioners and links the various economic development communities. The journal focuses on contemporary research publication philosophies including blind strict peer refereeing, timely review, regular publication and broader coverage of the field. The editorial board is represented by the world's reputed and experienced academicians and researchers from various fields. The blind peer review and editorial policies are largely contributed by the CSIRS. The journal is completely open access which has opened the doors for the millions of international readers and academicians to keep in touch with the latest research findings in the various fields. International Journal of Scientific & Innovative Research Studies specializes in quantitative & qualitative development policy analysis. The target readers of the journal include economists and other social scientists in government, business, international agencies, universities, and research institutions. The journal strives to provide the most current and best research in the various fields. E-Publication First is a feature offered through our journal platform. It allows PDF version of manuscripts that have been peer reviewed and accepted, to be hosted online prior to their inclusion in a final printed journal. Readers can freely access or cite the article. The accepted papers are published online within one week after the completion of all necessary publishing steps. Each paper published in International Journal of Scientific & Innovative Research Studies is assigned a DOI number, which appears beneath the author's affiliation in the published paper. Click HERE to know what is DOI (Digital Object Identifier)? Click HERE to retrieve Digital Object Identifiers (DOIs) for journal articles, books, and chapters. Cross Ref, Cross Check, Cabell's, Ulrich's, Griffith Research Online, Google Scholar, Education.edu, Informatics, Universe Digital Library, Standard Periodical Directory,Gale, Open J-Gate, EBSCO, Journal Seek, DRJI, ProQuest, BASE, InfoBase Index, OCLC, IBSS, Academic Journal Databases, Scientific Index. Prof. Ashutosh Sinha, Deptt. of Rural Management, Dr. R.M.L. University, Faizabad. Satish Kumar, Information Scientist & Head, Knowledge Resource Centre, AREAS-Uttarakhand. Dr. Yogesh Narayan Singh, Asst. Professor, N.N. PG College, Nawabganj, Gonda-U.P. Santosh Kumar, Faculty of Operations & Systems, IBS Hyderabad, Andhra Pradesh, India . Dr. Shipra Verma, Asst. Professor, Dr. B.R.A. Rajkiya Mahavidyalaya, Kannauj. Dr. Hemendra Singh, Asst. Professor, Dr. B.R.A. Rajkiya Mahavidyalaya, Kannauj. Dr. Harshendra Pratap Singh , Asst. Professor, Govt. Degree College, Unnao. Dr. Nutan Singh, Associate Professor, Y.D. College, Lakhimpur Khiri, Uttar Pradesh. Dr. Shnaoli Chakraborty, Associate Professor, Golapbag University of Burdwan, West Bengal. Dr. Alka Singh, Department of Sociology, BBA University, Lucknow, Uttar Pradesh.